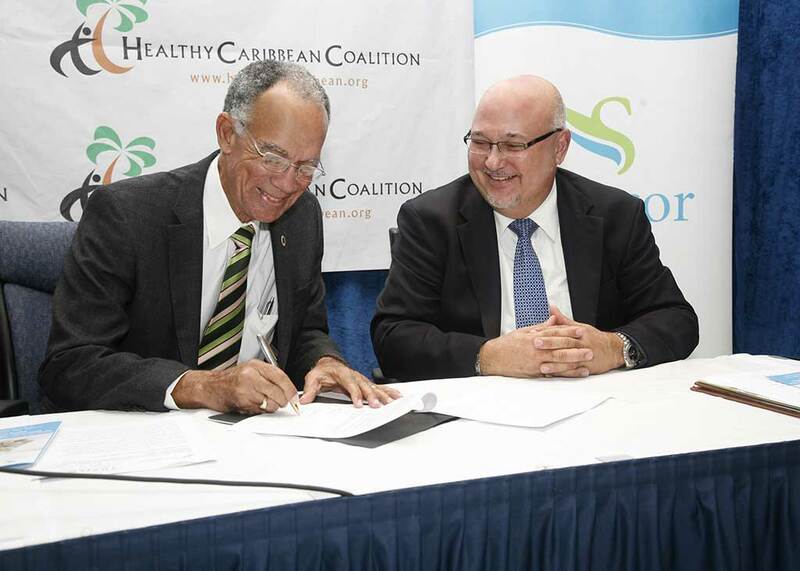 Professor Trevor Hassell (left), chairman, Healthy Caribbean Coalition (HCC) and Special Envoy for NCDs and Chairman NCD Commission, shakes hands with John Edward Clarke, Chief Operating Officer, Sagicor Life Inc and General Manager Barbados Operations after signing the MOU. 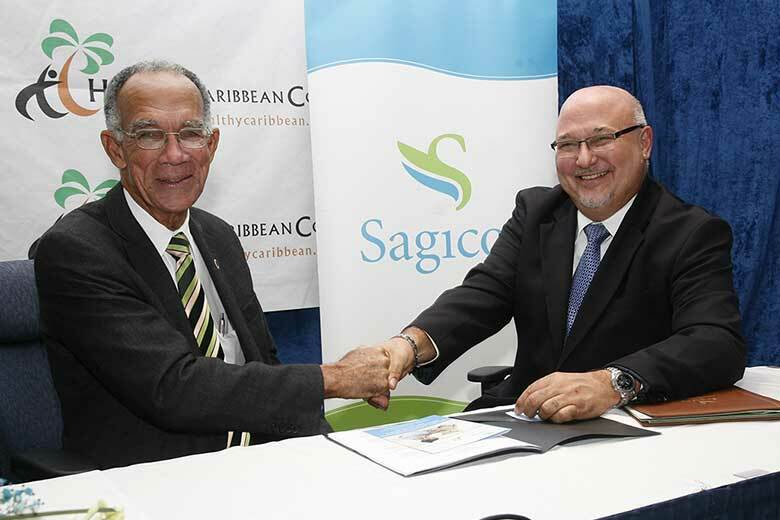 MOU Signed Between Sagicor Life and HCC. 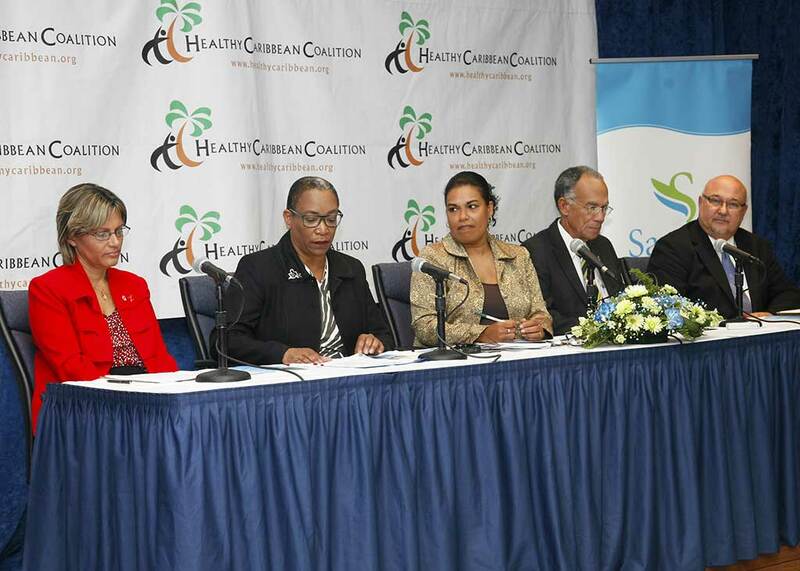 On the 18th September 2012 at the headquarters of the United Nations sub regional office for Barbados and the Eastern Caribbean, in the presence of distinguished guests, invitees & members of the press, the signing of a Memorandum of Understanding between Sagicor Life Inc. and the Healthy Caribbean Coalition took place. It is imperative that the private sector becomes more involved in the battle against chronic non-communicable diseases (NCDs). That is the view of John Edward Clarke, Chief Operating Officer, Sagicor Life Inc and General Manager of Barbados Operations. Clarke put forward this viewpoint yesterday afternoon, just moments after he signed a Memorandum of Understanding (MOU) on behalf of Sagicor Life Inc. with the Healthy Caribbean Coalition (HCC) at the headquarters of the United Nations sub regional office for Barbados and the Eastern Caribbean. That MOU will provide much needed funding for the HCC over the next three years, to assist in carrying out its work and by extension, to reduce the incidence of NCDs. “Five years ago the Heads of Government of the Caribbean Community or CARICOM met at the Regional Summit on Chronic Non-Communicable Diseases or NCDs, and determined that strategies for the reduction of the burden of NCDs were a priority which all regional governments should fully support. 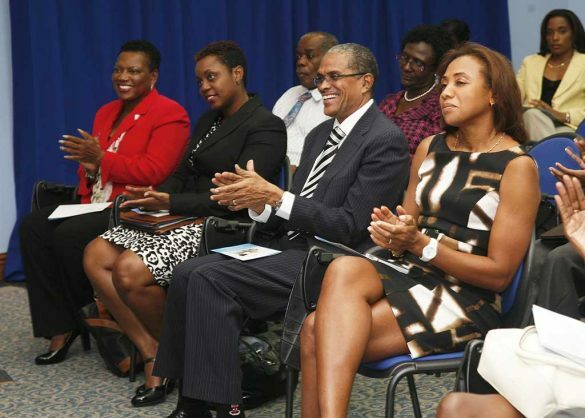 As we all know, a task of this magnitude cannot be successfully accomplished by governments alone and, as such, CARICOM has called upon all of its citizens, including individuals, communities, non-governmental organisations and the private sector, to support the policies and programme devised to combat the NCD epidemic,” he noted. With that in mind, he noted that the MOU is a decisive step towards the prevention and control of NCDs, adding that as an organisation committed to initiatives and developments which will improve life in the communities in which they operate, Sagicor fully supports the mission and objectives of the HCC. The Chief Operating Officer revealed that statistics collected from Sagicor Life over the past three years, have shown that there has been an increase in the number of claims attributed to chronic diseases. Moreover, he said, that in Barbados, Trinidad and the countries of the Eastern Caribbean, approximately one-third of all claims are paid as a result of those diseases. He indicated that as the HCC focuses on communication and advocacy, Sagicor Life Inc. is also working with the Chronic Disease Research Centre of the University of the West Indies, Cave Hill Campus to quantify the extent of the impact of NCDs, through a newly established Health Economics teaching position. “Education, we believe, is one of the most effective ways to counteract the social and economic effects of NCDs. 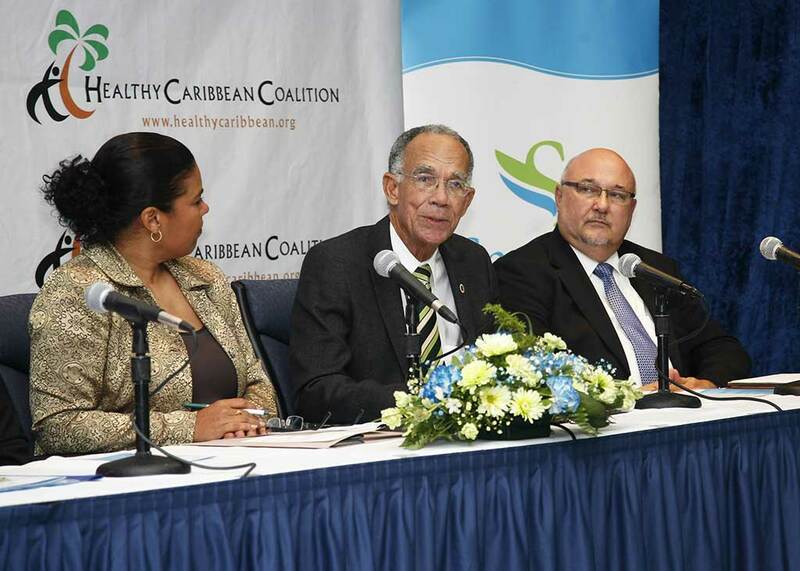 Each year in Barbados and the Eastern Caribbean, approximately 77 per cent of deaths occur as a result of NCDs and we believe that through our partnerships with the University of the West Indies and the Healthy Caribbean Coalition, it is our mission to engineer significant reductions in the number of individuals affected by these diseases annually,” he added. View or download the remarks made by the panel present at the signing of the MOU and relevant documents by clicking on the links displayed below. Images from the historic signing.